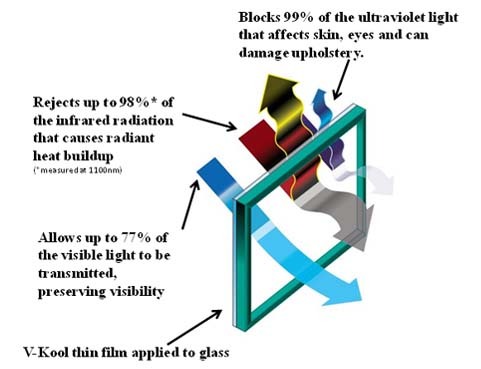 V-KOOL technology is based on rejecting heat at the window versus absorbing the heat like ceramics and other film technologies. When applied to glass, V-KOOL allows up to 77% of visible light to pass while eliminating over 96% of infrared and 99% of ultraviolet light. Retrofit your existing windows or apply to your newly constructed windows. V-KOOL,Inc., the exclusive distributor in the western hemisphere, is the clear choice for your need to block the heat while allowing light to pass through. In most cases, applying V-KOOL Window Films is at least half the cost of replacing your windows with high performance glass. Call us to find out how big your savings can be! V-KOOL is the world's first clear, spectrally-selective applied film, which transmits more than 70% of daylight while rejecting 99% of ultra-violet, and 94% of infra-red heat. Spectrally-selective films have transparent, metalized coatings designed to transmit, reflect or absorb different wavelengths of the solar spectrum. In the case of V-Kool, it is designed specifically to be light transmitting while rejecting heat without the "mirror" look. When was V-KOOL first introduced? V-KOOL was first installed in the U.S. in 1991 and was originally invented as a specialty item for the U.S. government and was applied to the U.S. Military's Stealth Bombers. Performance data was obtained using a Perkin-Elmer Lambda 9 Spectrophotometer in combination with the "Window 4.0 Fenestration Program" provided by the Windows and Daylighting group at the Lawrence Berkeley Laboratories, the world's foremost window science group. No other spectrally selective window film has been around half this length of time. How is V-KOOL different from other films or "tint"? V-KOOL cannot be compared to other competitive films because it is proven to be the most technologically advanced spectrally-selective coating in the world. Other films are classified as conventional films, meaning that they are either tinted or reflective films. Tinted films require significantly less sophisticated technology to produce; hence the cost is low. Conventional reflective films utilize conventional evaporative deposition technologies, adapted from the same technology used to coat the insides of common potato chip packs. Instead of looking at the initial cost of V-KOOL, you should consider its life cycle cost as well as other intangible benefits. While there is a premium associated with the purchase, V-KOOL reduces air conditioning operating cost, reduces fading damage to draperies and furnishings, allows occupants to use floor space near windows even in the direct sunlight because of increased comfort. Productivity and alertness are heightened in such comfort-enhanced environments. It is a long-term cost-effective investment. V-KOOL is manufactured through multi-layered sputtering. The raw materials and the high tech coating process gives V-KOOL its unique performance which are costly. For instance, the product uses pure silver, gold, and indium oxide (even more costly than silver) to form the 7-layer V-KOOL optical stack. These materials are deposited one layer at a time onto a super clear polyester substrate (only the top 1% of all polyester that are produced daily in the world can meet our specifications) at a rate of 2m/min per layer. The custom built sputtering machine costs 18 million dollars. This is the same equipment used to deposit the radar evasive skin on the Stealth Bomber! As such, what you are getting is a deceptively clear looking V-Kool film, loaded with nothing but the best that tomorrow's technology can offer. Will V-KOOL affect my cell phone reception or wireless devices (internet)? No, V-KOOL will have no effect on these devices.